Wages are stagnating and rents are rising. Work is not only hard to find, but increasingly exploitative and insecure. People are forced to take on more jobs and loans just to get by. Privatization has turned entire cities into playgrounds for financial speculation, as social support systems have been withdrawn under the banner of austerity politics. In short, precarity has become a generalized condition. As a discipline that intersects with almost every aspect of life, architecture provides a context in which we can gauge the neoliberal regime of perpetual debt and unremitting labor. 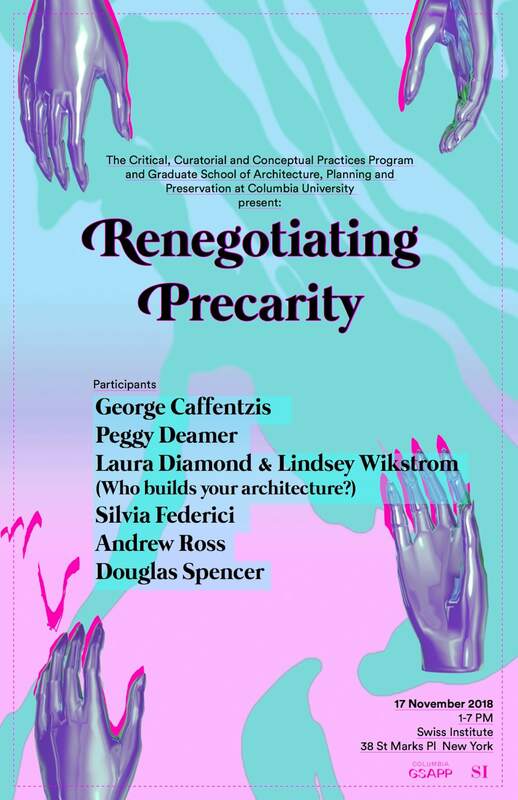 The symposium organized by the Critical, Curatorial and Conceptual Practices program, Renegotiating Precaracity, will explore the causes and symptoms of precarity through specific structures like the home, the office, and the jobsite. One of its aims is to examine the effects of the always and never changing economic order on the way we live and work, while maintaining a focus on the role of architecture within it. However, precarity is not intended to be viewed as a fixed or given set of conditions, but as a field of struggle that continually has to be renegotiated. The other aim of the conference is, therefore, the identification of possible alternatives and sites of resistance. George Caffentzis is an Emeritus Professor of Philosophy at the University of Southern Maine, in Portland, Maine. He has written many essays and books on social and monetary themes: they include essays collected in two books–In Letters of Blood and Fire and No Blood for Oil–as well as two books on the philosophy of money: Clipped Coins, Abused Words and Civil Government: John Locke’s Philosophy of Money and Exciting the Industry of Mankind: George Berkeley’s Philosophy of Money. He is working on a book about David Hume’s philosophy of money. Peggy Deamer is Professor of Architecture at Yale University. She is a principal in the firm of Deamer, Architects and before that, Deamer + Phillips, Architects. She received a BA from Oberlin in philosophy, a BArch from The Cooper Union and a Ph.D from Princeton University. The work of her firms has appeared in Dwell, the New York Times; Architectural Record, House and Garden, and HOME New Zealand; and articles by Deamer have appeared in Assemblage, Praxis, Log, Perspecta, and Harvard Design Magazine, amongst others journals and anthologies. She is the editor of Architecture and Capitalism: 1845 to the Present and The Architect as Worker: Immaterial Labor, the Creative Class, and the Politics of Design. She is co-editor of Building in the Future: Recasting Architectural Labor; BIM in Academia; and Re-Reading Perspecta. She is the founding member of the Architecture Lobby, a group advocating for the value of architectural design and labor. Laura Diamond is a PhD candidate in Architectural History at Columbia University, co-founder of the architecture practice Kamara Projects, co-organizer of Who Builds Your Architecture?, and a Visiting Assistant Professor at the Pratt Institute School of Architecture. Her writing has been published in the book Facing the Music as well as The Avery Review and Camera Austria. Through Kamara Projects and Who Builds Your Architecture?, she has collaborated on installations in the Istanbul Design Biennial, the Chicago Art Institute, and Photo Kathmandu. Silvia Federici is a feminist activist, teacher and writer. In the 1970s, she was one of the founders of the international Campaign for Wages for Housework. She was also one of the founders of the Committee for Academic Freedom in Africa and the Radical Philosophers’ Anti-Death Penalty Project. She is the author of books and essays on women’s history and feminist theory, political philosophy and education. Her published works include: Caliban and the Witch: Women, the Body and Primitive Accumulation, Revolution at Point Zero, Witches, Witch-hunting and Women, Re-enchanting the World: Feminism and the politics of the Commons and The New York Wages For Housework Committee: History, Theory, Documents. 1972-1977. Silvia Federici is Emerita Professor at Hofstra University. Andrew Ross is a social activist and Professor of Social and Cultural Analysis at NYU. A contributor to the Guardian, the New York Times, The Nation, and Al Jazeera, he is the author of many books, including Creditocracy and the Case for Debt Refusal, Bird On Fire: Lessons from the World’s Least Sustainable City, Nice Work if You Can Get It: Life and Labor in Precarious Times, Fast Boat to China–Lessons from Shanghai, No-Collar: The Humane Workplace and its Hidden Costs, and The Celebration Chronicles: Life, Liberty and the Pursuit of Property Value in Disney’s New Town. His forthcoming book, (from Verso) is titled Stone Men: The Palestinians Who Built Israel. Douglas Spencer is Associate Professor and Director of Graduate Education at Iowa State University’s Department of Architecture, and author of The Architecture of Neoliberalism (2016). His work critically theorizes the relationship between architecture, landscape and the production of subjectivity. His writing has been published in Radical Philosophy, e-flux, New Geographies and Volume, and in collections such as This Thing Called Theory (2016), Architecture and Feminisms (2017), and Landscape and Agency (2017). Lindsey Wikstrom is an architectural designer, researcher, and educator based in New York. Her practice investigates the effects of architecture on the human experience of the city through the lens of perception and access. She co-founded a product design and fabrication company in 2012, is an adjunct faculty member at Columbia University’s Graduate School of Architecture, Planning and Preservation where she earned her Masters of Architecture. She is a recipient of the SOM Traveling Fellowship and is a contributing member of the nonprofit organization Who Builds Your Architecture.